Koushik Dutta, or just Koush, is one of the more well-known developer names in Android and has been in the game for a long time. Previously known for his work on ClockworkMod, then for releasing various apps, he is back yet again, this time testing out a new app called Inkwire. 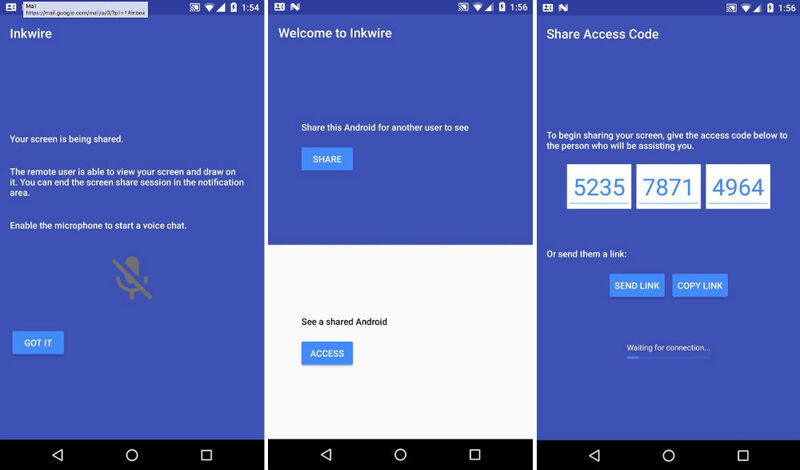 Inkwire is an Android-to-Android screen sharing and remote assistance application. With it, two individuals can pair devices without the need for ADB or a computer. Once two people are paired via an access code, they can get to work on whatever they may need to do. This app could be useful for the resident tech geek in a family, who is always being asked to fix a family member’s phone. The app is not yet available on Google Play, but should be coming relatively soon. At this time, Koush is looking for beta testers over on Google+. Read below on how to get involved. First, I’ll let Koush explain his app. Unlike Vysor, it doesn’t require ADB or a computer. Just plain old Android to Android screen sharing, without the cords. Since ADB is required to send the touch and keyboard events, Inkwire can’t do that. I’m working around this by drawing over the screen to show the remote user where to touch; the experience is still pretty good. Also has built in voice chat. To get in on the beta testing action, follow the link below and join the Inkwire community. Koush should be posting up the beta APK pretty soon.